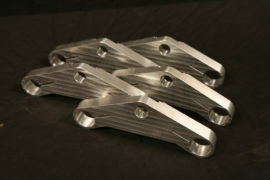 Ripple Rock Racers Honda CB500/550 Billet Triple Clamp Assembly has a machine carved top triple to match the bottom triple design to create a custom look. The bottom triple is double bolted on each side and is increased in thickness for strength (1 1/2 inch billet). The bottom triple also has the “spacer” machined into it so there is no need for an additional spacer washer to fit the tapered roller bearing. The bottom triple comes complete with the tapered roller bearing pressed on (1 thousand of an inch interference fit) and a bottom dust seal. The new steel steering stem is hollow core to decrease weight and is designed with a bottom lip to fit securely into the machined relief in the bottom triple clamp. This special design feature guarantees a precise fit that will not accidentally come apart! The bottom triple has the steering stops fitted and the top triple is drilled to accept the stock instrument cluster using our Gauge Brackets and will accept our Key Mount. The Triple Clamp Assembly can take our aftermarket 2.25” Chrome Mini Gauges and our Dual Mini Gauge Console or our Deluxe Mini Gauge Bracket and LED Kit. All Billet Triple Clamp Assemblies come with all stainless steel clamping bolts and an upper and lower All Balls Tapered Roller Bearing Kit. This package insures a straight bolt on installation into your Honda frame. 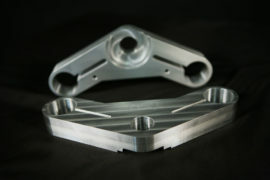 Comes standard with the machined finish on the top and bottom triple and includes the bottom tapered bearing installed.